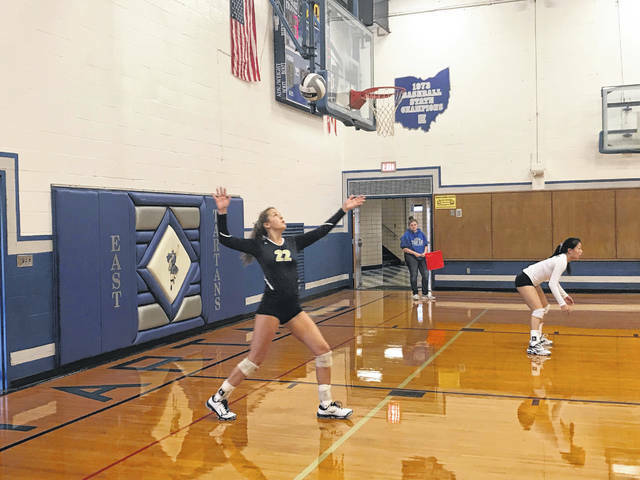 The Notre Dame Lady Titans volleyball team looked to be in midseason form after their victory Thursday night in a road trip to Sciotoville to face off against SOC I rival, the East Tartans. The beginning of the first set would start off in East’s favor as they jumped out to an early 3-2 lead, before succumbing to the excellent play by the Lady Titans. Notre Dame would go on scoring runs of six, seven, and eight points and ultimately pull away with a victory in the first set, 25-6. In the second set, Notre Dame would carry their momentum over from the previous set by scoring the first ten points, causing East to take an early timeout. The attempt to slow the Lady Titans momentum down would prove to be unsuccessful as they would score the next six points of the match to take a 16-0 lead. East would not give up, however, as they showed excellent fight towards the end of the set by scoring six of the final fifteen points scored to bring the final score of the set to 25-6, just the same as the first. Notre Dame’s excellent serving abilities proved to be the difference make in the third and final set of Thursday night’s contest. The Lady Titans would once again open up by scoring the first ten points of the set before East was able to score their only point of the final set. The Lady Titans would prove victorious in the final set by a score of 25-1, and sweep all three sets of the match, 3-0. You can catch the Lady Titans at home next Tuesday night as they face off against the New Boston Tigers in yet another SOC I matchup. JV begins at 5:30.